Large shipping companies don’t let their ships sail the Mediterranean for days. They’d rather moor the ships close to the Strait of Gibraltar, after which the containers have to continue their journey on smaller boats. That takes a long time. 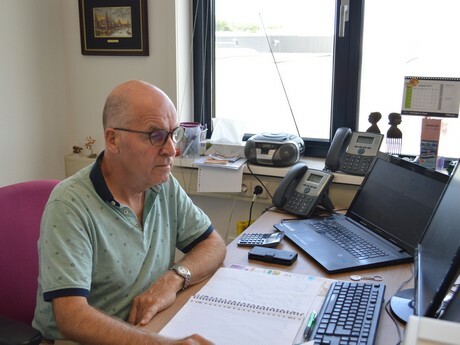 This is why Anton Rutten from Maasdijk, the Netherlands, has run a purchasing office for a Greek company for three years now. “Sometimes we import products from Greece, but we’re mostly active exporting to Greece,” Anton says. They mostly transport limes, mangoes, avocados, pineapples and other exotic fruits to the Southern European country. Besides, Anton buys “all products of which there’s a shortage in Greece.” During the summer months, the trucks can be filled with tomatoes, bell pepper and lettuce, for instance. This summer saw a shortage of iceberg lettuce. In a normal summer, this lettuce costs between 2.50 and 3.50 euro, but the peak was at 7 to 10 euro in recent months. “Less is harvested, so demand was good,” Anton explains. He also loaded several batches of iceberg lettuce for the Greek parent company. Anton Rutten at work at his new office. Aphrodite Fruit from Maasdijk is part of the Souras Group. Besides the purchasing office in the Netherlands, Greek companies Global Fruits and Speedy Fresh are also part of the group. The Greek parts of the company primarily focus on the domestic market and supplying to cruise ships, hotels and restaurants. “Tourism is growing quickly in Greece, and a lot of cruises touch at the ports,” Anton says. In the past summer, he personally experienced the tourist crowds when he visited Santorini after roughly 20 years. “I’ve never seen so many quads,” he says. On Wednesday and Friday, the trucks leave from Maasdijk and head for Athens. The route crosses the Alps to North Italy, where the trucks take the ferry to Greece. This route is quicker than across the Balkans, where drivers are confronted with border crossings and customs formalities. “A truck leaving on Friday generally arrives in Greece on Monday evening or on Tuesday.” The transport from the Netherlands is cheaper and quicker than direct import to Greece. The large shipping companies don’t let their boats sail the Mediterranean that far. That means an intermediate stop, and the products have to then be transferred. Moreover, port dues are high in Greece. Anton buys the products on the day market. “Every day is different, that’s the interesting thing about this trade,” he says. The buyer doesn’t work with permanent partners, but looks for the “best market price.” From Greece, Anton receives orders about which products to buy. “The Greek trade isn’t bound by brands, and there’s always plenty of eagerness from the market to sell the products.” That’s partly due to the Greek preference for large sizes. Aphrodite Fruit moved as of 1 September. Anton now has an office on the Transportweg 20B in Maasdijk, in the same building as Transtolk, that can provide conditioned storage and transshipment. “Loading also happens here, so I’m now closer to my products,” the trader explains. This isn’t the only change. As he advances in years, Anton is now approaching the pensionable age. “I’m planning to stop mid-2019, but I’m still looking for someone to take over from me,” Anton concludes.